That guy is a tool, avoid his content, mate. I'd really prefer they keep it mysterious. I like this, because it's a small call out that might actually add more mystique to the story of the Men of Iron, but I'm hesitant to see much more. It's unlikely we will see more than that. GW likes to sprinkle DAoT and Men of Iron stuff all across the lore and these games are a great opportunity to use ideas and concepts that aren't going to make it into main 40k. There is no Men of Iron army, this guy is clearly not one of the titan class machines that could wreck armies on their own and the whole setting of the new Blackstone fortress and the nearby space station is remote enough that the reports will most likely just report it as what he tells people what he is ... some automaton sent by the AdMech to collect data. Yes, he's not a Castigator Titan, but those aren't Men of Iron. Castigator Titans are just advanced battle-mechs. UR-025 is a sentient machine, a bit different. I didn't even mention the Castigator. In Perpetual they describe the scrap-code that corrupted the men of iron as being all encompassing. Wonder how the robot survived it? Edited by Laughingman, 10 November 2018 - 09:28 AM. The more I think of it, the less I want a Men of Iron army proper. Having one or two that can be taken by the Imperium or Chaos (and really aren't allied much with either anyhow) would be cool. From what I recall there's actually a Dark Mechanicum HelForge that's run by either Men of Iron or at the very least an AI as well. In Perpetual they describe the scrap-code the corrupted the men of iron as being all encompassing. Wonder how the robot survived it? Who says he survived it? He might only be pretending to be allied with the Imperium. who said he did he has his own agenda and using the Admec disguise as cover is smart. Given it was tens of thousands of years before the current moment in time, the instance referred to in perpetual might have been all encompassing but not permanent. Edited by Marshal Rohr, 09 November 2018 - 12:57 PM. 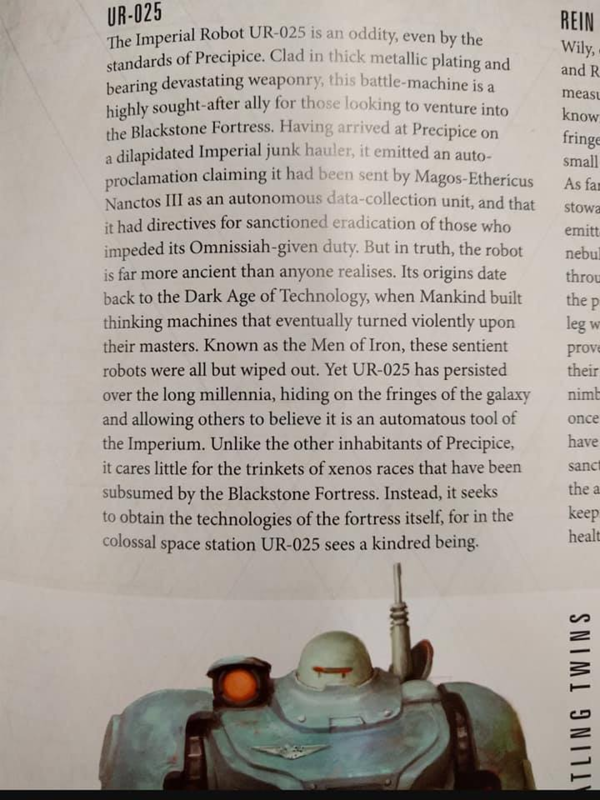 The lore in the Admech codex about some Kastelan robots mysteriously coming and going as they please suddenly seem more sinister, doesn't it? @Flame Boy, my secret hope is that Imperial Robots are cleaned out and reprogrammed Men of Iron. That the Castellax, Vulturax, etc were an attempt to build on that older tech. That’s actually quite a plausible idea: take some deactivated Men of Iron, perform robo-lobectomy, patch in some organic wet-ware, reboot, job’s a good ‘un. Now waiting for BSF part 2 to feature a huge, gene-bulked techno-barbarian who is secretly a Thunder Warrior. I've never really seen the men of iron as the true threat but more the AI that inhabits the robots. The comic strip Pax Imperialis portrayed this really well where it was more of a hive mind rather than them having individual personalities like the droids in star wars or robots in transformers. I've always pictured it to be more like the 1999 film Virus. I swear...I seem to recall Men of Iron (or perhaps just DAoT non-AI) maintenance droids beating the *cuss* out of Space Marines in one of the FW black books. Could someone confirm? So I think that yes...the AI is the primary threat to human existence, but their individual physical combat bodies would also be extremely hard to neutralise with Imperial-era tech. In Gaunts Ghosts novel First and Only, they find a (chaos corrupted) STC that produces Men of Iron. The Ghost succeds to destroy it. Edited by Huggtand, 12 November 2018 - 06:43 AM. I am a man, raised by wolves and warriors in a world of ice and fire. I am a primarch, made by the Emperor to the patterns of forgotten science. Duality is part of my nature. 'The false Russ nodded as he circled around his other self, his high, black boots crunching in the snow. 'The civilized barbarian. The magic hater who surrounds himself with mumbling priests. The berserk thinker. The leashed hound who runs free. The Terran Fenrisian. ''Aye, 'said Russ.' That's me. It does a man no favours to be straightforward. The thing the Space Wolves fought in their exemplary battle was one. The Tabula Myriad from Cybernetica and Myriad was another. The Myriad was capable of reversing scrapcode corruption and analytically predicting if a planet would fall to chaos. It was attacked and contained by the Iron Hands while it was attempting a pre-emptive extermination, then got released back on Mars by desperate Loyalists. Yeah you are thinking of the Assault on the Tempest Galleries. Salamanders vs dark age of technology robots that maintained the tempest shield generators, that were covering the caucus wastes. I don’t think the tempest maintenance robots were individual AI’s, but it mentioned they were collectively controlled by a machine spirit which was an AI. The robots were immune to bolters, plasma and melta, but could be destroyed by massive kinetic force. The salamders brought some down hand to hand and improvised to bring the rest down by turning some of the automata against the rest and by using electromagnetic attacks. The salamanders won, but only 1000 of the original force of 20k survived. Edited by Robbienw, 12 November 2018 - 12:39 PM. Same! This is cool, but I've always disliked the rather bland interpretation of the "Men of Iron" as straight-out machine rebellion. The original passage they come from is much more abstract and interpretable (with the Men of Gold and Stone Men), which always seemed much more interesting and historical.